"Bombshock" redirects here. For the Transformers character, see Micromasters. 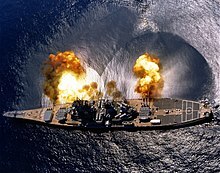 In physics, a shock wave (also spelled shockwave), or shock, is a type of propagating disturbance that moves faster than the local speed of sound in the medium. Like an ordinary wave, a shock wave carries energy and can propagate through a medium but is characterized by an abrupt, nearly discontinuous, change in pressure, temperature, and density of the medium. For the purpose of comparison, in supersonic flows, additional increased expansion may be achieved through an expansion fan, also known as a Prandtl–Meyer expansion fan. The accompanying expansion wave may approach and eventually collide and recombine with the shock wave, creating a process of destructive interference. 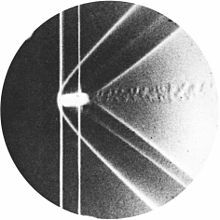 The sonic boom associated with the passage of a supersonic aircraft is a type of sound wave produced by constructive interference. At 90° (perpendicular) to the shock medium's flow direction. At an angle to the direction of flow. 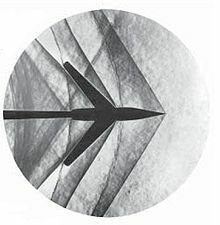 Occurs upstream of the front (bow) of a blunt object when the upstream flow velocity exceeds Mach 1. In supersonic propulsion: ramjet, scramjet, unstart. In flow control: needle valve, choked venturi. NASA took their first Schlieren photography of shock waves interacting between two aircraft in 2019. 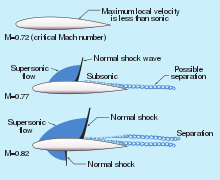 In fact, correct capturing and detection of shock waves are important since shock waves have the following influences: (1) causing loss of total pressure, which may be a concern related to scramjet engine performance, (2) providing lift for wave-rider configuration, as the oblique shock wave at lower surface of the vehicle can produce high pressure to generate lift, (3) leading to wave drag of high-speed vehicle which is harmful to vehicle performance, (4) inducing severe pressure load and heat flux, e.g. the Type IV shock–shock interference could yield a 17 times heating increase at vehicle surface, (5) interacting with other structures, such as boundary layers, to produce new flow structures such as flow separation, transition, etc. 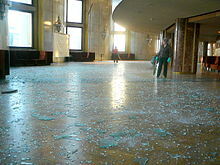 ^ Zel’Dovich, Y. B., & Raizer, Y. P. (2012). Physics of shock waves and high-temperature hydrodynamic phenomena. Courier Corporation. ^ Landau, L. D., & Lifshitz, E. M. (1987). Fluid Mechanics, Volume 6 of course of theoretical physics. Course of theoretical physics/by LD Landau and EM Lifshitz, 6. ^ Courant, R., & Friedrichs, K. O. (1999). 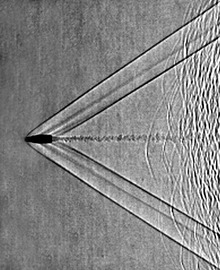 Supersonic flow and shock waves (Vol. 21). Springer Science & Business Media. ^ Shapiro, A. H. (1953). The dynamics and thermodynamics of compressible fluid flow, vol. 1 (Vol. 454). Ronald Press, New York. ^ Liepman, H. W., & Roshko, A. (1957). Elements of gas dynamics. John Willey & Sons. ^ Tang, Shao; Tesler, Federico; Marlasca, Fernando Gomez; Levy, Pablo; Dobrosavljević, V.; Rozenberg, Marcelo (2016-03-15). "Shock Waves and Commutation Speed of Memristors". Physical Review X. 6 (1): 011028. arXiv:1411.4198. Bibcode:2016PhRvX...6a1028T. doi:10.1103/physrevx.6.011028. ^ Solem, J. C.; Veeser, L. (1977). "Exploratory laser-driven shock wave studies". Los Alamos Scientific Laboratory Report LA-6997. doi:10.2172/5313279. OSTI 5313279. ^ Veeser, L. R.; Solem, J. C. (1978). "Studies of Laser-driven shock waves in aluminum". Physical Review Letters. 40 (21): 1391. Bibcode:1978PhRvL..40.1391V. doi:10.1103/PhysRevLett.40.1391. ^ Solem, J. C.; Veeser, L. R. (1978). "Laser-driven shock wave studies". Proceedings of Symposium on the Behavior of Dense Media Under High Dynamic Pressure. (Editions Due Commissriat a l'Energie Atomique, Centre d'Etudes Nucleaires de Saclay, Paris) (Los Alamos Scientific Laboratory Report LA-UR-78-1039): 463–476. ^ Veeser, L.; Solem, J. C.; Lieber, A. (1979). "Impedance-match experiments using laser-driven shock waves". Applied Physics Letters. 35 (10): 761. Bibcode:1979ApPhL..35..761V. doi:10.1063/1.90961. ^ Solem, J. C.; Veeser, L.; Lieber, A. (1979). Impedance-match experiments using laser-driven shock waves. Proceedings of 7th International AIRAPT Conference, High Pressure Science and Technology, le Creusot, France, July 30-August 3, 1979. (Pergamon Press, Oxford, England). 35. p. 971. Bibcode:1979ApPhL..35..761V. doi:10.1063/1.90961. ISBN 9781483148526. ^ Veeser, L.; Lieber, A.; Solem, J. C. (1979). "Planar streak camera laser-driven shockwave studies". Proceedings of International Conference on Lasers '79. 80: 45. Bibcode:1979STIN...8024618V. OSTI 5806611. ^ Hoover, Wm. G.; Hoover, Carol G.; Travis, Karl P. (10 April 2014). "Shock-Wave Compression and Joule-Thomson Expansion". Physical Review Letters. 112 (14): 144504. arXiv:1311.1717. Bibcode:2014PhRvL.112n4504H. doi:10.1103/PhysRevLett.112.144504. PMID 24765974. Krehl, Peter O. K. (2011), "Shock wave physics and detonation physics — a stimulus for the emergence of numerous new branches in science and engineering", European Physical Journal H, 36 (1): 85–152, Bibcode:2011EPJH...36...85K, doi:10.1140/epjh/e2011-10037-x.